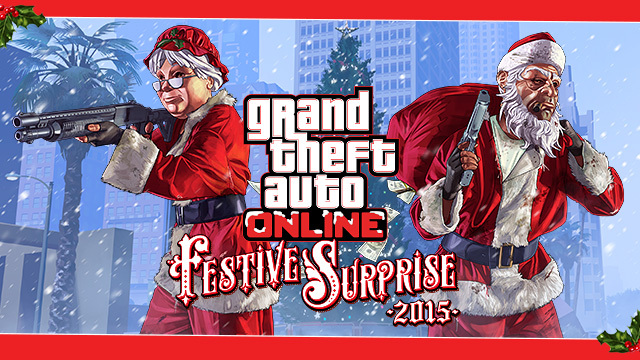 Celebrate the holiday season in Los Santos now through January 5th with the Festive Surprise 2015 for GTA Online. Also, all festive attire from years past will be available during the holiday period for all platforms including original Masks and Clothes from both last year’s Festive Surprise and the original 2013 Holiday Gifts. Plus keep an eye out for special gifts on all platforms during the holidays, including the chance for a few snowball fights during the rare phenomenon of Los Santos snowfall in the forecast as well as some special additions to the growing collection of fun Adversary Modes on PS4, Xbox One and PC.